IIM Udaipur presents the second edition of its annual HR Conclave – Spandan’14 – One day to go! 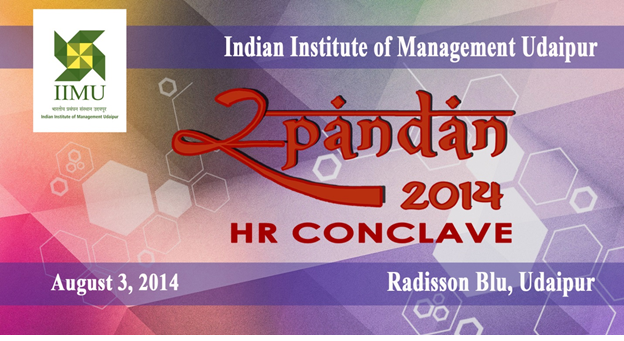 Indian Institute of Management, Udaipur presents the second edition of its annual HR Conclave – Spandan 2014 to be hosted on 3rd August, 2014 at Hotel Radisson Blu, Udaipur. IIM Udaipur aims to set new benchmarks in the field of management education and research and events like this come under the channel of initiatives aiming to create a platform for discussing subjects and issues that are most relevant to the current times and future trends. Carrying forward the legacy from the last year’s inception of Spandan, this year’s edition is conceptualized around the central theme of “Rethink: Changing HR practices with Changing Times”. The conclave will see the participation of learned practitioners on the likes of Mr. Rajeev Bhadauria, Director Group HR, Jindal Steel & Power Ltd and Mr. Vinod Rai, Head – Corporate HR, Maruti Suzuki from the field of Human Resource Management who will share their insights and knowledge with the student managers of IIMU. – Rethink Approach: Are the present leadership programmes creating ‘leaders’ or ‘followers’? Spandan’s inaugural edition, held on 20th October 2013 at The Sheraton, Udaipur focused on the theme “Transforming HR for new business practices” with distinguished participants like Dr. T. V. Rao popularly known as the Father of Indian HR, Mr. Bomi Manekshaw – President HR, Cadilla, Mr. Rajandra Ambekar – Global HR Head, Wipro, Mr. Ganesh Ramakrishnan – Senior Director HR, Oracle Financial Services among others participating in the summit. The underlying purpose of the event is to bridge the gap between the industry and academics providing students with an opportunity to understand the dynamics of HR domain and to enrich the knowledge and perception of HR practices from the interactions with the experienced corporate leaders.